When anglers need the perfect round reel to match nearly any type of fishing situation the Ambassadeur SX steps up to the plate. A blend of quality, highperformance components and toughness in a compact package make the Ambassadeur SX a solid choice for every situation. Weighing in at just 316grams, the Ambassadeur SX has a frame that is crafted of machined aluminum and a compact bent handle and star that brings the anglers hands closer to the action. Providing a more comfortable fit when rod and reel are in hand. 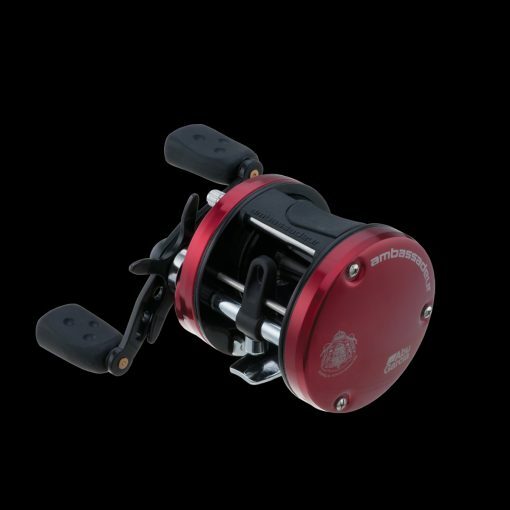 With the multi disk drag system the Ambassadeur SX gives anglers a smooth, consistent reel that holds drag pressure across the entire drag range. The synchronized level wind system improves overall line lay and castability, giving anglers a solid casting reel. Other features include three stainless steel bearings plus one roller bearing, six pin centrifugal brake system and soft touch handles for a more comfortable grip. The ergonomic, compact design of the Ambassadeur SX is available in a 5.3:1 gear ratio. The 5.3:1 gear ratio retrieve 62.5cm per turn.